Phyllis Elaine Herren was born on October 25, 1938, to Charlie and Beulah Campbell in Pauls Valley, Oklahoma. She passed away on February 6, 2019, after a hard fought battle with lung cancer. 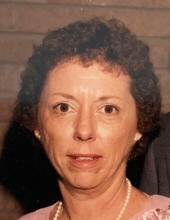 She is survived by her daughters Susan Ramsey and her husband, LR Ramsey, and Lisa Sherwood, grandchildren, David Ramsey and Amy Ramsey, Kyle Fincham, Jessica Furey, Austin and Hunter Smith, Nicole Morris, and great-granddaughter, Rayne Caldwell, plus several cousins, nieces, and nephews. She was preceded in death by her husband of thirty years, Harold Herren, her parents, her brothers, Jay and Don Campbell, one sister and her husband, Janelle and Jon Law, and two special friends, June Wall and Sylvia Martinez. She grew up in south Oklahoma City, graduated from Southeast High School and then attended Central Christian College, now known as Oklahoma Christian University, for one year before working as a secretary at Tinker Air Force Base. She later spent many years working as a homemaker and caregiver before beginning a career as a zyglo operator and painter in the aircraft and auto industries. She worked at Chromalloy, GM, Seagate, and Gulfstream before she was laid off following 9/11, giving her time to care for her mother before her mother’s passing. She began her Christian walk at South Shields Church of Christ, and has been a member of Eastside Church of Christ since 1968. She helped prepare materials for Vacation Bible School, shared items with the clothing giveaway, and provided care for the children of young mothers. She loved meeting visitors in the parking lot and helping them “get to know” Eastside. She also had a special concern for the spiritual well-being of many as they neared the end of their lives—-reaching out to them to make sure they were ready to meet the Lord. She was a dedicated caregiver. She patiently cared for Harold, her mom, and her brother, Don at the end of their lives. She and Harold fostered several children in the early 70s, including their daughter, Lisa. She came to them as a tiny, six pound, three-month-old. In that time foster adoptions were not allowed, so a year and a half later, when she was going to be placed with a new family, Phyllis and Harold fought to make her a part of the family. They were eventually successful in adding her to the family. Phyllis loved to travel. Vacations were usually camping trips, but later she and Harold enjoyed traveling in their motorhome. They traveled the country to see old friends-the Walls, the Sheriffs, and the Martinez families. She often repeated stories about the last trip she and Harold took with Grandma Campbell to the Ozarks. Like her mom, she was known for her green thumb. She had the most beautiful yard on Elm Street and nearly an acre of flower beds at her home in the country. She could keep her family fed for more than a year on the canned fruits and vegetables harvested from a small garden plot on the city lot on Elm. She also grew iris, day lilies, and a multitude of trees. When it was time for a leaf collection assignment from school, the grandkids only had to go one place-Grandma Phoebe’s! She loved collecting antiques, which she often classified as “junktiques,” and finding bargains at garage and estate sales. She also loved buying just about anything her mom wanted or needed, sending Grandma Campbell on a tour of New England, being a Girl Scout leader, making ceramics, sewing, collecting Hallmark Christmas ornaments for herself and her mom, making Christmas wreaths, shopping at Cracker Barrel, sweet ham, her own special recipe of green beans, sweet potato casserole, maple cream of wheat, creamy tomato soup, and grapefruit juice. The family wishes to thank Dr. Pareek and his kind nurses, Robin and Bess, the nurses at Stephenson Cancer Center, and the nurses and staff at Oklahoma Hospice Care for their patient care during her illness. We also want to thank Steve Morris for his help during her cancer treatment, Mary Ann and Kent Bizzell and Helen Cannefax for their friendship, encouragement and help with Mom over the last two years and for the prayers and encouragement from our Christian family at Eastside. To send flowers or a remembrance gift to the family of Phyllis Herren, please visit our Tribute Store. "Email Address" would like to share the life celebration of Phyllis Herren. Click on the "link" to go to share a favorite memory or leave a condolence message for the family.